Each character card has a name and a rank. The rank is written at the top left of the card and goes from 1 to 30. The higher the value, the more important the rank. The character with the highest rank is the Spanish governor. The one with the lowest rank is the parrot (one of the captain's mascots). In the lower left, in the silver mark, is a number which corresponds to the character's influence on the other crews. It's a simple method to solve ties, as we'll see later in the rules. In short, when two characters of the same rank are played at the same time, it's the one with the highest influence (the greatest value in its silver mark) who is considered to be of higher rank. The special actions are always associated with the time at which they are used, identified by a pictogram. Using a special action is mandatory unless otherwise written on the card. This special action is only resolved once per game, when the character is played. The day actions are resolved in increasing order of rank. This special action is only resolved once per game, when the character is played. The dusk actions are resolved in decreasing order of rank. 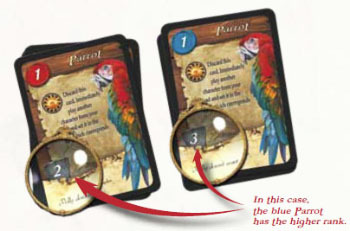 This special action is resolved during the night phase of each turn as long as the character with the action is present in the player's den. 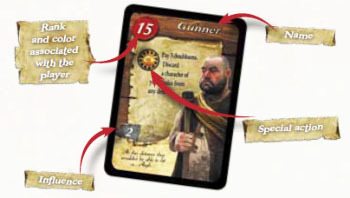 This special action is resolved only once per game, at the end of the campaign in which the character was played and only if it is still present in the player's den at the end of the campaign.